We are especially sensitive to those that are coping with the loss of a loved one. The release of white doves offers a spiritual and emotional release for those that are experiencing the loss, and provides a powerful healing effect and sense of closure. For these services, we suggest the Trinity Release. 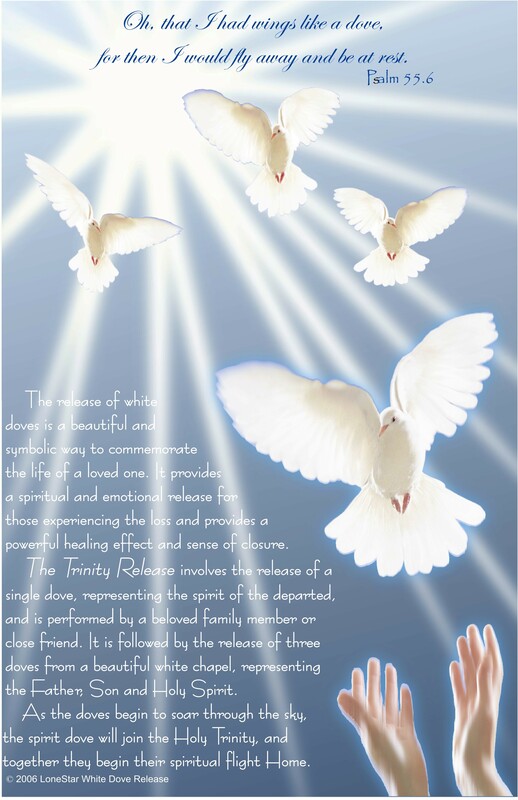 The Trinity Release involves the release of a single dove, representing the spirit of the departed, and is performed by a beloved family member or close friend. It is followed by the release of three additional doves from a white chapel, representing the Father, Son and Holy Spirit. As the doves begin to circle the sky, the spirit dove will join the Holy Trinity, and together they begin their spiritual flight Home. Looking for something more intimate? Send your love on the wings of a dove! We will deliver a snow white dove in a decorative box or heart shape basket, and upon opening, a beautiful white dove will appear, gently spread its wings, and take to the sky; an unforgettable expression of love and gratitude! Background music is provided, as well as the reading of your custom message, if desired. Great for Valentine's Day, Mother's Day, and other special occasions. Perfect for memorializing birthday's and anniversaries of loved ones who have passed on. ...and ceremonies of all types. The above suggestions are but a few of many ways we can customize a dove release. Call today and find out how we can make your event unique and memorable!